The iPad is big and bright and beautiful, so of course you want to draw all over it with your fingers. To facilitate that understandable urge, here are a couple of high-profile sketch products. Autodesk’s SketchBook Pro for iPad uses the same paint engine as its desktop companion, SketchBook Pro, and is similar to its iPhone app, SketchBook Mobile for iPhone. The iPad app features a multi-touch interface on a 1024-by768 pixel canvas. Operation includes a three-finger tap for controls and a three-finger swipe for quick access. 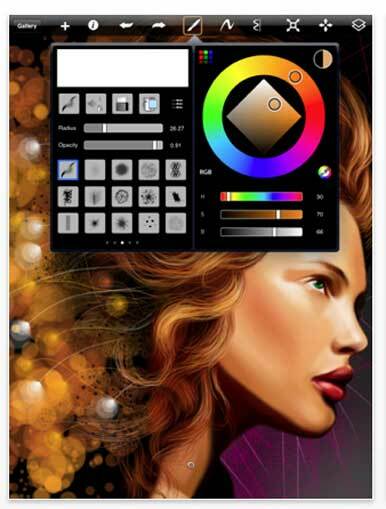 Brushes and tools include: 75 preset brushes, including pens, markers, natural media, and photo brushes with customizable brush settings; new Nature and Stamp brushes; draw styles for creating lines, rectangles, and circles; brush level sensitivity; 10 levels of undo and redo; and more. The app features six layers, and includes the ability to import layers from the photo library; duplicate, merge and reorder layers; move, scale and rotate layers; and toggle layer visibility and adjust opacity. The app’s gallery lets you store and view works in progress, export to the photo library, e-mail images, export as a layered PSD file, and browse in full-screen mode. The app also features a color wheel with HSB and RGB color space designations, customizable color swatches, eyedropper color selection, and the ability to convert any brush to a custom eraser. Visual help pages and a news panel to keep users in touch with events and information cap this offering. The app is $8 and runs on iPads with iPhone OS 3.2. Raizlabs’ SketchPad HD is a hybrid drawing and notetaking app for the iPad that allows you to create text notes as well as drawings, and flip through both. This $1 app lets you draw on a variety of colors and page backgrounds. Record and share your thoughts via email in PDF. With SketchPad HD, you'll always have a fresh sheet of plain white, ruled, legal, or graph paper available when you’re ready to jot down your thoughts. And you can integrate typed material into your notes as well. 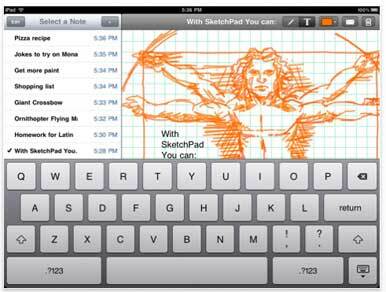 SketchPad HD is compatible with iPads running iPhone OS 3.2.